The Compact Ratcheting Modular Crimper provides fast, reliable connector termination for voice and data applications. This all-in-one tool, cuts, strips, and crimps data and voice cables. Its direct lateral crimp action provides more even, precise contact termination across all pins than ordinary indirect crimp tools. A compact, ergonomic design provides easy usage and storage. Tbook.com crawls the web to find the best prices and availability on Crimpers and related Tools and Hardware products like Klein Tools Compact Ratcheting Modular Crimper. For this page, related items include products we find that match the following keywords: "Crimper" at our vendor partner Home Depot. 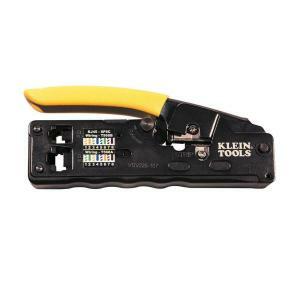 Klein Tools Compact Ratcheting Modular Crimper is one of 41 Crimpers and related products listed in the Tools and Hardware section of Tbook.com If you have any questions on this product, please give us a call at 734-971-1210 during the hours of 9am - 5pm EST for assistance. Thank you for shopping at Tbook.com, the Internet Department Store!